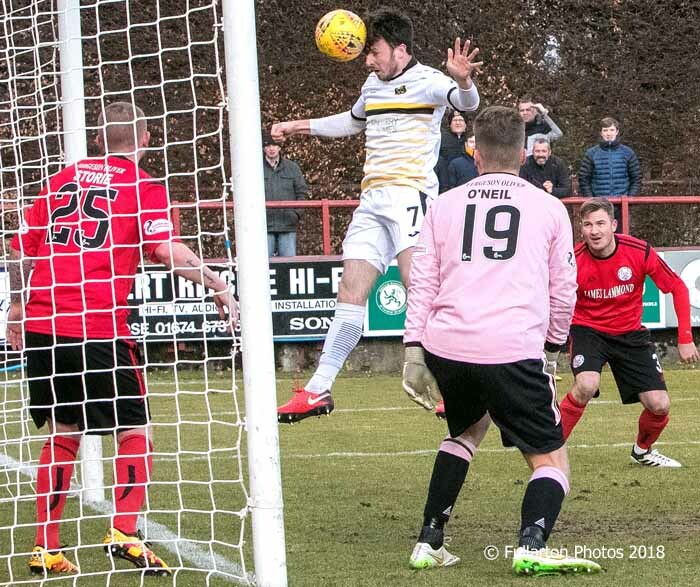 FOR the second time in a week Dumbarton beat Ladbrokes Championship bottom side Brechin City — this time in from of 445 people on a stunningly cold day at leafy Glebe Park. The scoring was opened after 10 minutes when a Dimitris Froxylias corner was headed across goal for Calum Gallagher to nod home (pictured). However Sam Wardrop then had to leave the game with an injury which it is hoped is not too serious. On 24 minutes the lead was doubled from another Froxylias corner. Andy Dowie's header deflected off Sean Crighton and found the net. Seven minutes from half time Craig Storie pulled one back for Brechin with a well placed free kick. But four minutes later Froxylias was again the provider as Andy Dowie knocked his corner across for Danny Handling to stab home. The second half saw a workmanlike Sons effort to protect what they had, but a penalty was conceded on 72 minutes. However Kalvin Orsi rolled the spot kick wide and the rest of the game was seen out. With this and results elsewhere, Sons are now four points behind eighth-placed Inverness Caledonian Thistle. And it is Caley Thistle who they face next — in Saturday's Irn Bru Cup final. Another bonus for manager Stevie Aitken was the comeback after months out through injury of full back Chris McLaughlin.